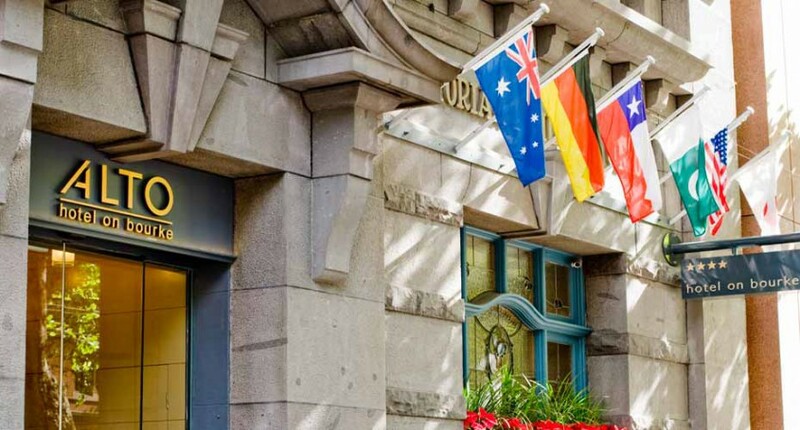 Alto Hotel, the award-winning four star boutique accommodation in Melbourne is our recommendation for eco-smart city travelers and urban explorers planning a business trip or leisure visit to Melbourne, Australia. Alto Hotel is not only distinctly “green” and dedicated to sustainability, but also extremely good at being a top-notch hotel. Alto Hotel on Bourke was our hotel of choice, not only because of its reputation as multi-award winning boutique hotel right in the center of Melbourne, but because of its uncompromising dedication to limiting its environmental impact through ‘green’ measures, such as using renewable energy – 100% wind power – for its electricity demand and the carbon offsetting of all its operational emissions. Few environmental fact sheets read as comprehensive as this one and its sustainability leadership has won Melbourne’s Alto Hotel many prestigious awards and prices, including the Victorian Tourism Award 2011 for Excellence in Sustainable Tourism (3rd year in a row) and the Conde Nast Traveler World Savers Award 2010 for environmental preservation. Among the most difficult aspects of getting an inner-city hotel up to scratch in terms of environmental sustainability is the fact that most hotels are not built from scratch but are established in existing buildings. This can be tricky, especially if classic late 19th century architecture has to be preserved. In this regard, Alto‘s owners clearly had a lucky hand in keeping the elegant look, while at the same time providing a contemporary, stylish interior and environmentally efficient hotel. And, while in some places commitment to environmental sustainability has already begun to fade – if it ever existed, Alto‘s general manager, Gary Stickland, has been vocal in making sure the hotel’s environmental leadership doesn’t tire. Just recently he introduced Sparky, the hotel’s very own electric car, available to guests for a small fee. Carbon emissions: a one night stay at Alto Hotel produces an average 11.8 kilograms of carbon, compared to an average 24-26 kilograms. All electricity used is generated from renewable sources, with many energy efficiency initiatives in place to keep consumption low. Water: Rain water is used for public toilet cisterns, gardening and cleaning duties. Water is used as efficiently as possible. Windows are double glazed, heat reflecting, reducing the need for air conditioning. Food is sourced locally whenever possible. Honey comes from Alto Hotel’s own rooftop beehive & fresh herbs from the hotel’s planter box garden. Waste is separated and kept to an absolute minimum. Transport: Electric share car from GoGet available for guest use. Cheaper than a hire car as you pay only for the time you use it. Walking and public transportation are encouraged (and indeed the easiest way to explore Melbourne CBD). Complimentary recharging of electric vehicles from Green Earth electricity (100% renewable resources). A dedicated Green Team checks on environmental initiatives. Enjoyed our review of Alto Hotel on Bourke in Melbourne? Share and spread the word!